After a relatively quiet, holiday-shortened week, the coming five days are shaping up to be volatile and extremely busy on the political, data and speaker front, where a barrage of economic updates is set to hit in both the US and across the globe, while Fed Chair Jay Powell will dominate the highlights on Tuesday with his testimony before the House, the week will culminate on March 4 with the Italian election and the SPD "Grand Coalition" vote. On the political side, while many expect a hung parliament in Italy and a small majority in favour of a Grand Coalition in Germany, uncertainty remains high. Meanwhile, in the US, Fed chair Powell's testimony will be closely watched on Tuesday, as will Draghi's appearance in Brussels on Monday. Core inflation in the euro area should rise slightly while confidence should fall, while spending in the US could see a weak start to the year. In the US: Fed Chair Powell's first semi-annual monetary policy testimony is on Tues. The speech will likely have a similar tone as the FOMC minutes, noting that growth has picked up and the FOMC has become more convinced of continued momentum. Powell is expected to sound cautiously optimistic, reiterating the need for patience when it comes to the hiking cycle. This will not be the place for Powell to hint at 4 hikes for this year. Meanwhile, there are a number of data releases this week, with the most important being Thursday’s personal income report. Real spending may have posted a drop in January, which would get Q1 real GDP off to a weak start versus consensus expectations of a sustained 3% pace this year. Euro area: Italian and German politics to take the limelight away from muted inflation This week looks set to be a long wait for the Italian election and the German SPD vote on a new Grand Coalition on Sunday. While most analysts expect a hung parliament in Italy and a small majority in favour in Germany, uncertainty remains high. Euro area headline inflation is likely to continue to decrease for a third straight month to 1.2% yoy in February, which would be the trough this year. Otherwise, credit growth should accelerate above 3.0% yoy. United Kingdom: Finally, the Brexit plan? The long-awaited speech by the Prime Minister, finally spelling out the “Road to Brexit: A Future Partnership” will surely be delivered this week. It was originally scheduled for last week, but, like so many of the UK’s plans on Brexit, has been delayed. Time is running out. Trade talks are meant to start after the 22, 23 March EU summit. Emerging Markets: There are monetary policy meetings in Korea, Israel and Ukraine. Sovereign rating reviews in Romania and Lebanon. Real GDP releases in Brazil, India and Poland. ECB President Mario Draghi speaks in Brussels on Monday. Bank of Korea has policy decision and briefing on Tuesday. Powell testifies before a House panel on Tuesday. He’ll discuss the Fed’s Semi-Annual Monetary Policy Report and the state of the economy. Powell returns on March 1 before a Senate committee. Companies announcing earnings this week include: Vale, BASF, Standard Chartered, Bayer, Lowe’s, Galaxy Entertainment Group, Anheuser-Busch InBev, Peugeot, WPP, and London Stock Exchange Group. U.K. Prime Minister Theresa May delivers a speech on Britain’s relationship with the European Union after Brexit. A barrage of data is expected out of Japan including retail sales and industrial production Wednesday, and capital spending Thursday. In China, the official and Caixin purchasing managers’ indexes on Wednesday and Thursday respectively may show growth momentum slowed slightly in February, though the signal may be clouded by the holidays. Monday: We start the week with the UK’s January Finance loans for housing. Across the pond, the January Chicago Fed National activity, February Dallas Fed manufacturing index and new home sales data are also due. Onto other events, the ECB’s Draghi will addresses the EU Parliament while the incoming ECB VP Mr De Guindos will also attend his confirmation hearing at the Parliament. Elsewhere, the ECB’s Coeure, BOE’s Cunliffe and the Fed’s Bullard will speak. The UK’s opposition leader Corbyn is expected to set out the Labour Party’s Brexit position today with the party set to announce that they would stay in the Customs Union. This will cause problems for Mrs May who has said the country will leave. Parliament is generally in favour of staying so this raises the possibility of a lost vote somewhere down the line. Tuesday: Germany’s flash February CPI and the Euro area’s money supply and credit aggregates are due. Then a range of February confidence indicators are due for the Euro area, France and Italy. In the US, the February Richmond Fed and CB consumer confidence index are due. Further, a range of data including: January advanced goods trade balance, wholesale and retail inventories, durable and capital goods orders along with the December FHFA and S&P corelogic house price index are also due. Onto other events, the Fed’s Powell testifies in front of the House Financial services committee. Elsewhere, the ECB’s Weidmann and Mersch as well as BOE’s Sam Woods will speak. The Brookings Institution will host a conversation with the former Fed Governor Yellen and Bernanke. Finally, the EU negotiator Barnier will brief European affairs ministers. Wednesday: Overnight, Japan’s January IP and retail sales along with China’s February composite and manufacturing PMI will be out. In early morning, the GfK consumer confidence index for the UK (Feb.) and Germany (March) are also due. Later on, the flash February CPI readings for the Euro area, France and Italy will also be out. Elsewhere, France’s January PPI and 4Q GDP along with Germany’s February unemployment rate are also due. 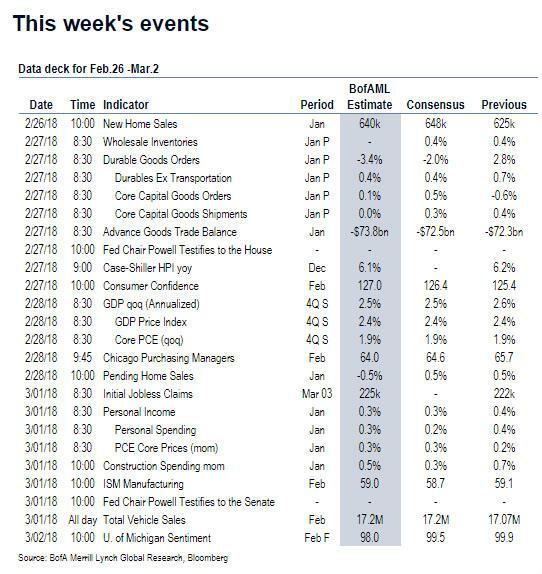 In the US, the February Chicago PMI, second reading on the 4Q GDP and Core PCE as well the January pending home sales data will be due. Onto other events, the EU negotiator Barnier will brief permanent EU representatives on Brexit and the withdrawal text is also expected to be published. Thursday: In Asia, the February manufacturing PMI for Japan (Nikkei) and China (Caixin) along with Japan’s consumer confidence index will be due. Then the final readings on February manufacturing PMIs across Europe are also due. Elsewhere, the Euro area and Italy January unemployment rate will be out. In the UK, the January net consumer credit lending and mortgage approvals along with the February flash manufacturing PMI are all due. In the US, a range of data will be out, including: January PCE Core, February ISM manufacturing index, personal income and spending, weekly initial jobless claims and continuing claims. Onto other events, the Fed’s Powell is back again in front of the US Senate while the US Transportation Secretary Ms Chao also testifies before the Senate on Trump’s infrastructure plan. The ECB’s Nouy and Lane along with the BOJ’s Kataoka will speak. Elsewhere, senior officials from Euro area finance ministries discuss the banking union and the future role of the ESM. Friday: Overnight, Japan’s January unemployment rate and February CPI will be out. Then the Euro area’s January PPI, Germany retail sales and the final reading for Italy’s 4Q GDP are due. In the US, the final reading for the February Uni. of Michigan’s consumer sentiment will also be out. Onto other events, the BOE’s Carney and the ECB’s Mersch will speak. The UK’s PM May is expected to outline her vision for a post Brexit trade deal with the EU. Then on Saturday, China’s annual national legislative meetings will start and expected to run for two more weeks. The key economic releases this week are the second vintage of Q4 GDP on Wednesday and ISM manufacturing on Thursday. In addition, there are several scheduled speaking engagements from Fed officials this week, including Chair Powell’s semi-annual Monetary Policy Report to Congress on Tuesday and Thursday. 08:00 AM St. Louis Fed President Bullard (FOMC non-voter) speaks: St. Louis Fed President James Bullard will give a speech on the U.S. economy and monetary policy at the 34th annual NABE Economic Policy Conference in Washington, D.C. Audience Q&A is expected. 10:00 AM New home sales, January (GS +4.0%, consensus +3.6%, last -9.3%): We expect new home sales to rebound 4.0% in January, following a 9.3% drop last month that we believe was partially weather-related. We expect a favorable fundamental backdrop and the solid trend in single-family building permits to mitigate the negative impact of higher mortgage rates on new homes sales activity. 03:15 PM Vice Chair for Supervision Quarles (FOMC voter) speaks: Federal Reserve Vice Chair for Supervision Randal Quarles will give a speech titled “An Assessment of the U.S. Economy” at the 34th annual NABE Economic Policy Conference in Washington, D.C. Q&A is expected. 08:30 AM Durable goods orders, January preliminary (GS -1.3%, consensus -2.5%, last +2.8%); Durable goods orders ex-transportation, January preliminary (GS +0.9%, consensus +0.4%, last +0.7%); Core capital goods orders, January preliminary (GS +0.9%, consensus +0.5%, last -0.6%); Core capital goods shipments, January preliminary (GS +0.3%, consensus flat, last +0.4%): We estimate durable goods orders fell 1.3% in January, reflecting a sharp pullback in commercial aircraft orders. However, we expect the core measures to firm, reflecting the timing of the Chinese New Year and the scope for core orders to rebound. Industrial production of the capex-sensitive business equipment was also quite strong in January. 08:30 AM U.S. Census Bureau Report on Advance Economic Indicators; Advanced goods trade balance, January (GS -$71.0bn, consensus -$72.0bn, last -$72.3bn); Wholesale inventories, January preliminary (last +0.4%): We expect the goods trade deficit to narrow $1.3bn to $71.0bn in January, reflecting a pullback in imports related to the relatively late Chinese New Year, which is likely shifting the timing of imports from January to February/March and could also pull forward some capital goods exports. 09:00 AM S&P/Case-Shiller 20-city home price index, December (GS +1.0%, consensus +0.6%, last +0.7%): We expect the S&P/Case-Shiller 20-city home price index to rise 1.0% in the December report following a 0.7% increase in the prior month. The measure still appears to be influenced by seasonal adjustment challenges, and we place more weight on the year-over-year increase, which climbed to 6.4% in November. 09:00 AM FHFA house price index, December (consensus +0.4%, last +0.4%): Consensus expects the FHFA house price index to rise 0.4% month-over-month, in line with the December pace. The FHFA house price index has a wider geographic coverage than the S&P/Case-Shiller home price index, but is based only on properties financed with conforming mortgages. On a year-over-year basis, FHFA home prices rose at a 6.5% pace in November. 10:00 AM Fed Chair Powell appears before the House Financial Services Committee: Federal Reserve Chair Jerome Powell will appear before the House Financial Services Committee in the first of two days of testimony to deliver the Fed’s semi-annual Monetary Policy Report to Congress and answer questions from lawmakers. The text of his prepared remarks will be released at 8:30 AM ahead of his testimony. 10:00 AM Conference Board consumer confidence, February (GS 127.0, consensus 126.0, last 125.4); We expect consumer confidence to move up 1.6pt to 127.0 in February. Our forecast reflects encouraging consumer sentiment measures in February as well as a rebound in the stock market. 08:30 AM GDP (second), Q4 (GS +2.4%, consensus +2.5%, last +2.6%); Personal consumption, Q4 (GS +3.7%, consensus +3.6%, last 3.8%): We expect a two-tenths downward revision in the second estimate of Q4 GDP to +2.4%, featuring a one tenth downward revision to personal consumption (to +3.7%) and additional downward revisions to government spending and exports. 09:45 AM Chicago PMI, February (GS 65.5, consensus 65.0, last 65.7); We expect the Chicago PMI to decline 0.2pt to 65.5 after moving down 2.1pt in the January report. Our above-consensus forecast reflects the mixed performance of manufacturing surveys balanced against firmer business confidence reports and encouraging commentary from industrial firms. 10:00 AM Pending home sales, January (GS flat, consensus +0.4%, last +0.5%): Regional housing data released so far were mixed in January. We estimate pending home sales were flat in January, and we note the current level looks elevated relative to other home sales measures. We have found pending home sales to be a useful leading indicator of existing home sales with a one- to two-month lag. 8:30 AM Personal income, January (GS +0.3%, consensus +0.3%, last +0.4%); Personal spending, January (GS +0.2%, consensus +0.2%, last +0.4%); PCE price index, January (GS +0.39%, consensus +0.4%, last +0.1%); Core PCE price index, January (GS +0.30%, consensus +0.3, last +0.2%); PCE price index (yoy), January (GS +1.7%, consensus +1.7%, last +1.7%); Core PCE price index (yoy), January (GS +1.5%, consensus +1.5%, last +1.5%): Based on details in the PPI and CPI reports, we forecast that the core PCE price index rose +0.30% month-over-month in January, which would leave the year-over-year rate unchanged at 1.5%. Additionally, we expect that the headline PCE price index increased 0.39% in January, or 1.7% from a year earlier. We forecast a 0.3% increase in January personal income and a 0.2% gain in personal spending. 08:30 AM Initial jobless claims, week ended February 24 (GS 225k, consensus 226k, last 222k): Continuing jobless claims, week ended February 17 (consensus 1,915k, last 1,875k); We estimate initial jobless claims moved back up 3k to 225k in the week ended February 24, after a sizeable decline in the prior week. The trend in initial claims appears to be falling, and we look for another low reading. Continuing claims – the number of persons receiving benefits through standard programs – declined sharply by 73k in the prior week. 10:00 AM ISM manufacturing, February (GS 59.2, consensus 59.0, last 59.1): Regional manufacturing surveys were mixed in February, and we expect ISM manufacturing to tick up to 59.2 in the February report. The Philly Fed (+3.6pt to 25.8) and Kansas City Fed (+1pt to 17) manufacturing sector surveys both strengthened while the Empire State manufacturing survey pulled back (-4.6pt to 13.1). On net, our manufacturing survey tracker—which is scaled to the ISM index—edged down 0.3pt to 58.7. 10:00 AM Construction spending, January (GS +0.6%, consensus +0.2%, last +0.7%): We expect construction spending to increase 0.6% in February, following a 0.7% increase in December that reflected stronger total private construction and public nonresidential construction activity. 10:00 AM Fed Chair Powell appears before the Senate Banking Committee: Federal Reserve Chair Jerome Powell will appear before the Senate Banking Committee in the second day of testimony to deliver the Fed’s semi-annual Monetary Policy Report to Congress and answer questions from lawmakers. 11:00 AM New York Fed President Dudley (FOMC voter) speaks: New York Federal Reserve President William Dudley will give a speech on trade and globalization at an event hosted by the Central Bank of Brazil. Audience Q&A is expected. 10:00 AM University of Michigan consumer sentiment, February final (GS 100.0, consensus 99.0, last 99.9): We expect the University of Michigan consumer sentiment index to edge up 0.1pt to 100 in the February final estimate, reflecting continued improvement among more timely measures of consumer confidence as well as the favorable stock market performance over the last two weeks. The University of Michigan’s survey of 5- to 10-year ahead inflation expectations was stable at 2.5% in the preliminary February report.